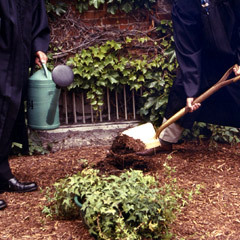 Members of the Senior Class plant ivy, read the Class Poem and the Class History, perform music, and sing the College Song. The Dean of the College announces dozens of individual student awards. The George Olmsted Jr. Class of 1924 Prize for Excellence in Secondary School Teaching is awarded to outstanding high school teachers nominated by Williams students. Tickets are not required for this event. Students awarded prizes can pick them up after Ivy Exercises at Commencement Central in the Paresky Student Center. Saturday of Commencement Weekend. Ceremony begins at 1:10 pm on the Library Quad. Rain plans: In case of heavy rain, Ivy Exercises will move to Lansing-Chapman Ice Rink.